Food, water, air. These are the basics people need to survive. Then comes shelter and a means of income, then family and friends, and finally at the stage of self-actualization, we experience creativity, morality, and an ability to problem-solve. At least, this is according to The Hierarchy of Needs, a basic outline of what motivates humans to fulfill their needs, created by psychologist Abraham Maslow in 1943. All social workers and psychology students learn about the "hierarchy". In my job readiness class this week, I asked my students what they think they will need in order to succeed in life. While I wanted them to think about the basics, like paying rent and buying food, I wasn't thinking specifically about Maslow's Hierarchy of Needs. So, when Jose responded, "Do you mean that triangle thing? ", I was speechless. I realized quickly what Jose was referring to. 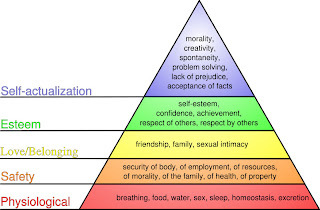 He had obviously learned about the Hierarchy of Needs in his high school psychology class. What shocked me for a moment was that he retained information from one class, and correlated it to the subject matter in another. This may not seem impressive, but in the context of Jose's life, and the fact that he failed the last school year, it's a clear indicator that he is making tremendous strides academically and personally. Had we not created the overage kids class, and if we were not giving Jose individualized counseling and positive reinforcement, he would not be learning about basic psychology principals let alone thinking ahead to how he can achieve in a career and support himself financially. For me, Jose's reference to "that triangle thing" was one of those small moments that proves that social workers are conduits for change.